Charles is the key person in the partnership at Kaishe. He has an ideal little farm plot to look after himself. He also travels extensively to preach the gospel, frequently into the DRC which is a few kilometres from his village. We have been providing a small level of support to supplement his income. Charles Chibale Chola was born in 1967 and was kept well by his parents up until 1973 when he was enrolled to start Grade 1 the following year. His father bought everything for him to use at school. However his father later died in December of the same year. At that stage Charles started to suffer terribly. His mother remarried and his step-father didn't consider Charles to be his dependent. Mr Chibesa (his step-father) didn't bother buying him school uniforms, books or paying school fees for him. This led his mother to start brewing munkoyo so that she could earn some funds to support him at school. Charles also started doing some odd work to give his mother a hand. Because of this, when he went to secondary school he failed to do well in his examinations. In those days students needed to have extra tuition. His friends were going for these but he couldn't because he lacked funds. Finally he failed to do well with the Grade 12 examinations. He tried to find employment but couldn't because he had no skills to support himself which made life difficult. Despite this, in 1983 he received Jesus Christ as his personal Saviour and the Word of God through his brothers and sisters in the Lord encouraged him during this suffering. In 1995 he became an evangelist/teacher working in the Samfya District. In this work he became more and more aware of the number of orphans, particularly in his area Chitundwe, who were suffering almost in the same way he used to. This got him thinking and he started to support them with the little he could afford. One day he gave K1,000 to the head teacher of Kaishe Basic School to help one orphan who he could see was in much need, another day he gave a pencil and so he continued with the little support he was able to give. He became increasingly frustrated with the minimal support he was able to give and the fact he didn't have any skills. He shared the need with his wife Janet who was also burdened by the need around them. She encouraged him and got involved, pounding cassava mealie meal to give to some of the orphans. The help was little and only what they could share from their home. Later Charles and his wife talked to the brothers and sisters in their church whom they felt had the same spirit of assisting and they agreed to help by giving Charles and Janet the little they could afford. In 2005 Bright Hope World met Charles - he cycled for 8 hours to come and see us with his wife on the back of the bike! 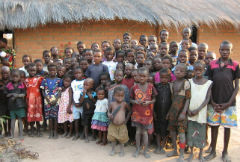 We were impressed with his desire to help the orphans in his community and the steps he had already taken to do this. Charles has two gardens, one for the dry season and one for the wet season, and tries to make a living by cultivating but as the Training Centre and Orphan Care projects develop this is taking up more of his time and limiting his ability to support himself. 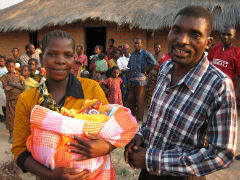 This partnership provides a small level of personal support for Charles and Janet. Charles is a good man and has a real desire to make a difference in his community. He knows firsthand what a lot of these children are experiencing and wants to give them opportunities he didn't have. He is a leader in the community, a hard worker and has a real love for God and for people. He has also surrounded himself with a good team of people from various nearby churches. Charles is married to Janet and they have 8 children. In 1998 he went to Samfya Bible School and following that became a church planter / evangelist / teacher. He lives in Chitundwa village in the Luapula Province of Zambia but travels regularly preaching and teaching, even into the DRC as the border is nearby. Bright Hope World wants to help set up Charles to increase the income he makes from farming so he can concentrate on both church planting and also overseeing the orphan project and skills training centre. In 2012 he started a few business ventures, such as buying a Yager press to press sunfloweer seeds into oil, creating a fish pond, and using soyabeans to create different products. In 2013 we will help him in these areas by giving him a lump sum from his personal support and a micro-loan as a top up to kick start his income generating ideas. It is anticipated that this will then enable him to be completely self-supporting and no further financial support will be required from BHW.